I knew it had been awhile since I blogged..but I had no idea it had been over a MONTH! I HAVE been busy...just not telling about it! - youngest's birthday. He is now 14 ..that means we survived the 1st teen year of our youngest child. WHEW! We are now up to contact lenses, unlimited texting, and Future Freshman night! its gonna be a wild 4 yrs ahead I can tell you that! - an unexpected visit from our daughter. The AF told her she would NOT have a week off at Christmas, then proceeded to tell them too LATE to buy airline tickets , that yes in fact , they DID have a week off. She told me she was driving from San Antonio to Abilene...when in FACT, she was headed HOME. 9pm...no lights on outside...expecting no company...ding dong! Dogs go WILD! Turn on outside lights. OH MY GOODNESS! She's HOME! We were happy to have her from Monday to Saturday...and her little dog Chewie (you thought I was going to say TOTO didnt' you?!) FOUR male dogs...they had a BLAST and looked for their newest 'cousin' for a week after he left! -and New Year's Eve. Its no fun waking up at the stroke of midnight to dog claws trying to either 1. pull themselves up on the bed, or 2. roll you OFF the bed. In any case, they were in my THIGH...I banned him from the room. I think the 14 yr old let him sleep on the couch in the family room (BIG no no in this house...dogs on the furniture), but at 12:30, I didn't care a WHIT! Now i'm happily ensconced at home ...doing what you ask? 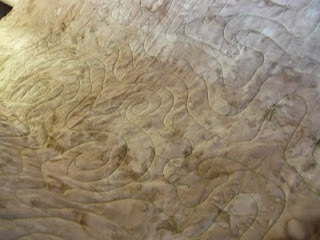 QUILTING of course! I finished the fleece throw and its happily being used with a sick girlfriend. 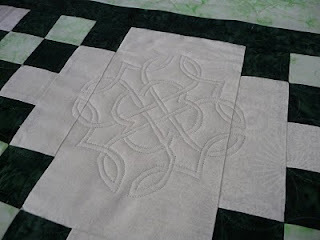 I quilted a gazillion celtic knots on a green and white Irish chain for a dear online friend. (ok...maybe only 20 knots..but alot!) She trusted me with this quilt that is a wedding shower present for her son and DIL-to-be. It arrived in safety and it currently being bound. 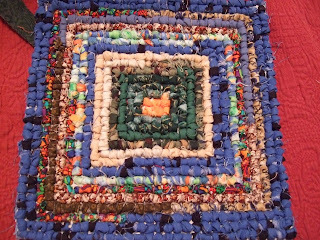 The continuous curve quilting in the chains is not as visible. I was so focused on MAILING it, I didn't take anymore pictures when it was FINISHED!. I was just relieved it was done and arrived in time. This week I'm finishing up 2 QOV I picked up to quilt at my local long arm guild. I got 2 pillowcases with a top, backing and batting. All I have to do is decide what to quilt on it. This is the 1st one. 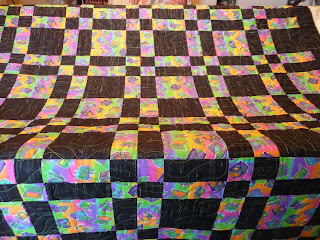 It has a computer fabric in vibrant colors with a black sashing and alternate blocks. 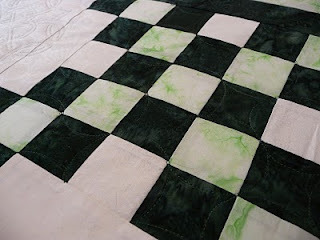 I was lucky to have seen a quilt at maryquilts.com I riffled around in my sewing room and watched The Pajama Quilter DVD to refresh my memory and VOILA! DWIRLING! Is fun, fast and mindless...I think it suits this quilt quite well. I thanked Mary for refreshing my memory. Nice to have another all purpose design under my belt! It reminds me of a topographical map. I'm off to load the 2nd QOV...I promise pictures...it could take me awhile to decide tho. Its a red/white/blue string quilt with lace on some of the strings. Not sure I can do a pantograph as I will not be able to see the fabric. That lace makes me nervous!